A so-called direct home buyer by the name of OfferPad that agrees to purchase homes in as little as 24 hours has announced a new joint venture with loanDepot to provide financing to those who use its platform. Specifically, the link up will look to solve one of the more common problems home sellers face – financing a new home purchase while they still own their old home. This can present all types of issues, with loans typically falling through thanks to debt-to-income ratios being too high with two mortgages to account for, or because sellers don’t want an offer that is contingent on a sale of the buyer’s existing home. This apparently resolves those issues by combining a bridge loan from loanDepot with a guaranteed purchase from OfferPad. In a nutshell, a homeowner can agree to sell their existing home to OfferPad and also receive short-term financing for their next home purchase via OfferPad Home Loans. The loan will bridge the gap that occurs when the home seller is finalizing their old home sale. Instead of having to sell first, then find a new home to buy, they can do both things at once and still qualify for mortgage financing. All without the obligation of finding temporary housing. Once they close on their old home, they can convert the short-term loan to a more traditional mortgage, such as a 30-year fixed mortgage. The process will be driven by loanDepot’s proprietary technology platform called “mello,” which is a “fully-digital” mortgage application. The companies are also exploring new ways to provide “customized instant purchase offer solutions” to loanDepot customers, along with real estate agent and home builder referral partners in specific markets. Perhaps the end goal is to make both home buying and selling and the mortgage process a fairly instantaneous thing. It is after all somewhat pointless to sell your home in 24 hours (or a week) if you don’t have a new home to move into, or other arrangements in place. So being able to finance a subsequent home purchase is vital to the value of offering a quick sale of an existing home. 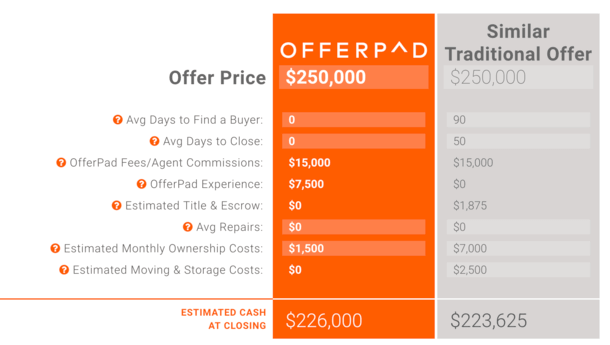 Like other iBuyers out there, OfferPad can provide prospective home sellers with an all-cash offer in as little as 24 hours simply by answering some questions and snapping some photos. Once you agree to a price and sign a purchase contract, OfferPad will arrange for a home inspection to ensure the property is in good shape. Like a normal home purchase, anything that comes up during the inspection could count against you and affect the proceeds you receive from the sale. The screenshot above provides a sample estimate of cash at closing versus a traditional sale. You can choose the date you want to close escrow, from just five days to as many as 90. OfferPad also offers “Free Local Move” for those who are relocating within 50 miles of their old home, and will pay all of the seller’s title and escrow fees. At the moment, OfferPad is available in eight markets nationwide, including Atlanta, Charlotte, Las Vegas, Los Angeles, Orlando, Phoenix, Salt Lake City, and Tampa. They expect to launch in additional markets in the coming months. Similar companies in the space include Redfin Now, which has Redfin Mortgage at its fingertips, and Opendoor, which recently launched Opendoor Mortgage. It seems the cozying up of real estate companies and mortgage lenders is a growing trend that is showing no signs of slowing. loanDepot has announced yet another joint venture between itself and AV Homes, which effectively creates a new mortgage lending entity by the name of AVH Mortgage. The new partnership leverages loanDepot’s mello technology while providing a wide range of lending products to prospective home buyers. AVH Mortgage will be based out of Scottsdale, Arizona with a centralized team of licensed loan consultants supporting AV Homes communities across five markets (Charlotte, Jacksonville, Orlando, Phoenix, and Raleigh). AV Homes was founded in 1970 and sold 2,465 homes in 2016. They build communities for people of all ages as well as those aged 55+.